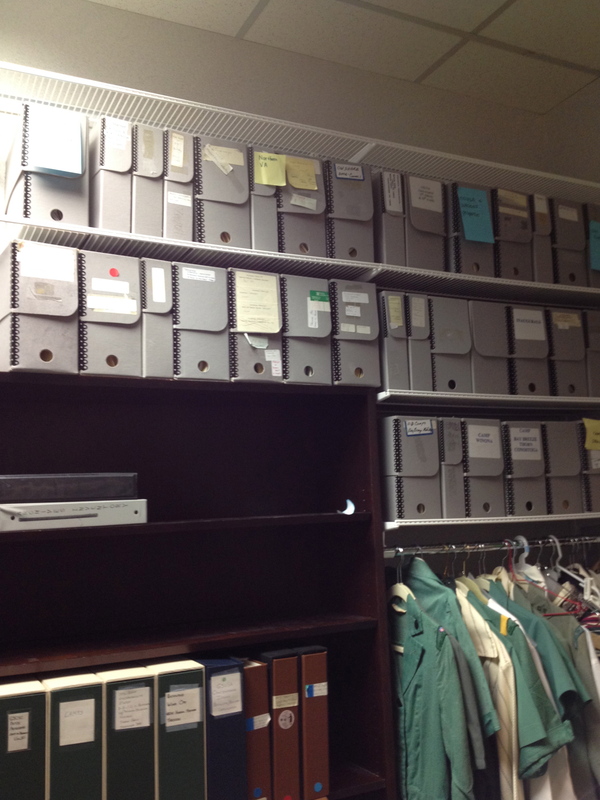 Recap: We had to empty out the archives storage space while the Council office gets new carpet, so we “seized the day” to reorganize our space. 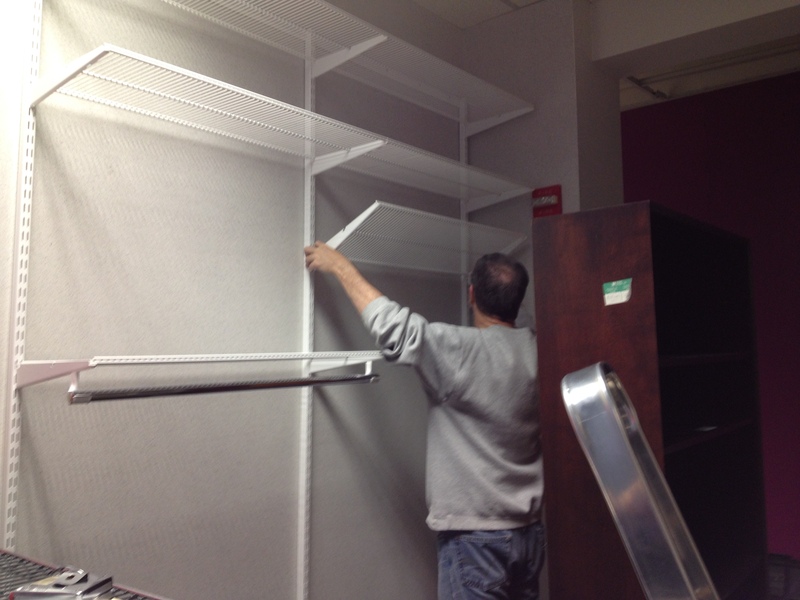 Today my husband installed the new Elfa shelving that he configured for the archives “pod” space at the Council headquarters. 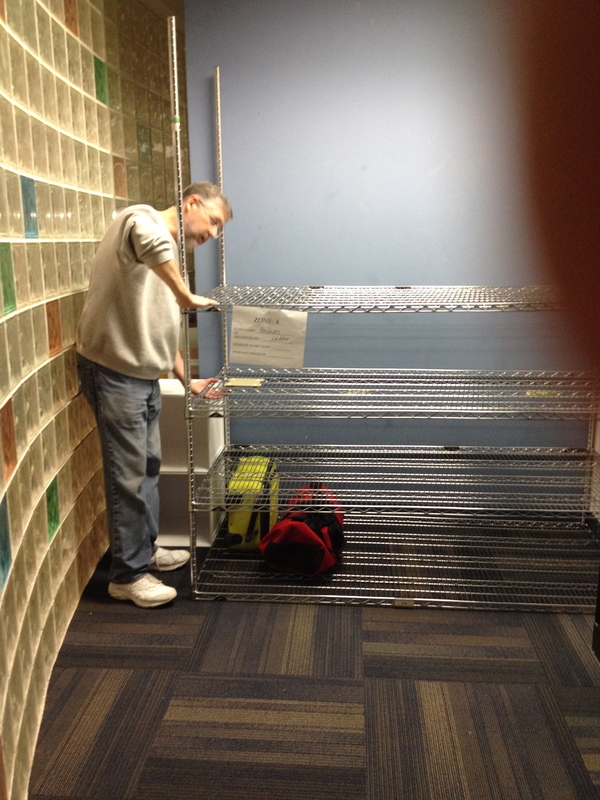 He added high, ventilated shelves to hold our assorted Hollinger Metal Edge boxes. Elfa shelves can be easily adjusted for height. 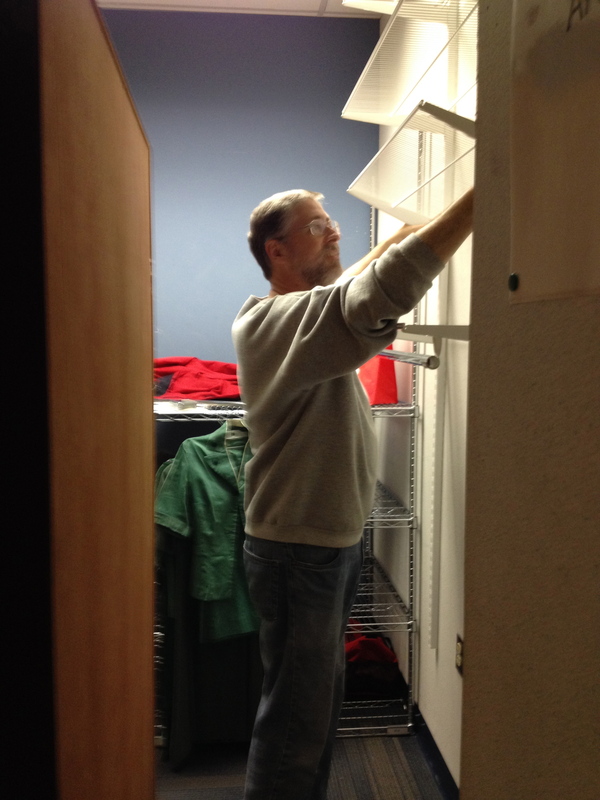 Mark is an expert with Elfa shelving. Mark also adjusted the existing shelves to the same height as the plastic storage tubs (66 qt Sterilite ClearView Latch from Target) I used to group similar objects and boxes. We will add two more shelves later. With standardized tubs, we can fit more items in and hopefully locate them more easily. We kept one existing bookshelf and added a built-in hanging rod for uniforms. We moved most of the items back into the pod, but others will have to wait until we have additional shelves for the baker’s rack. They are stored at the council equipment site in Virginia. Looks like we need new labels for some of our boxes. There also is an additional high shelf where we will put empty boxes and other supplies. We have a second hanging rod that we can use if needed, but we would need to adjust the shelf height first. With the current Elfa sale at the Container Store, the cost of the new shelving was just under $200. Thanks Mark! You’re the best! 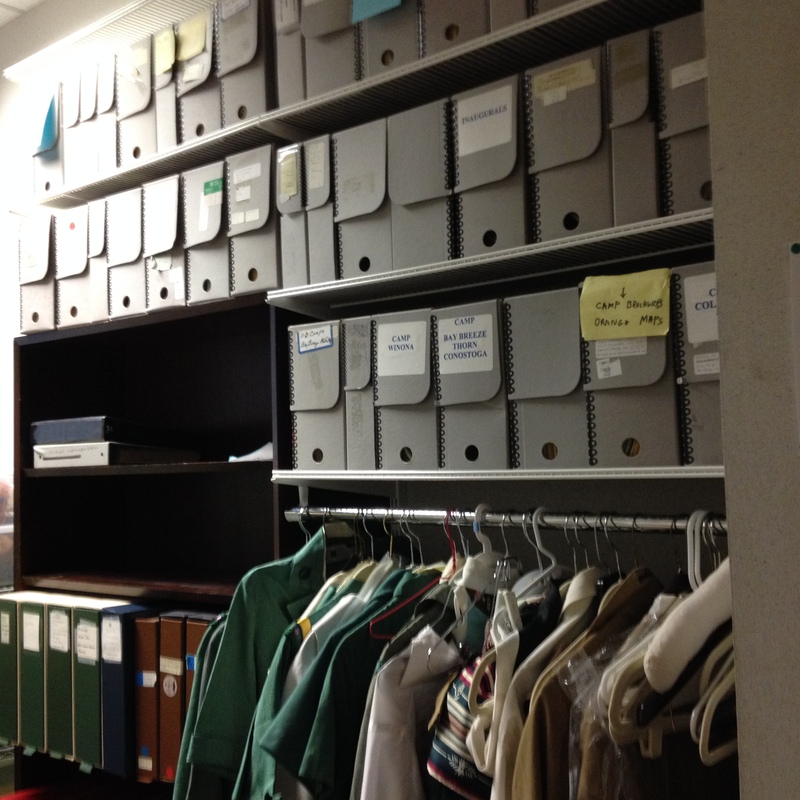 This entry was posted in Storage and tagged Girl Scout Council of the Nation's Capital, Girl Scout history, Girl Scout memorabilia, Girl Scouts, GSCNC, museums archives. Bookmark the permalink. Looking great – but unless those uniforms are worn often, wouldn’t it be good to safeguard them better in a closed storage area of some sort – maybe a zip-closed garment rack, and hang some cedar blocks in with them? That would help keep mice, moisture, and fading away from them. 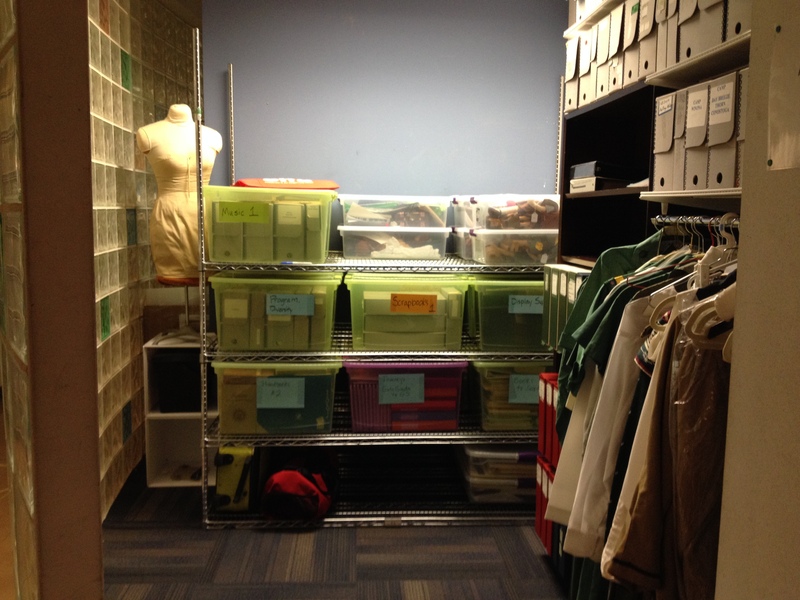 Our uniform collection is safely kept in the temporary storage units we have in Prince George’s County, Maryland. 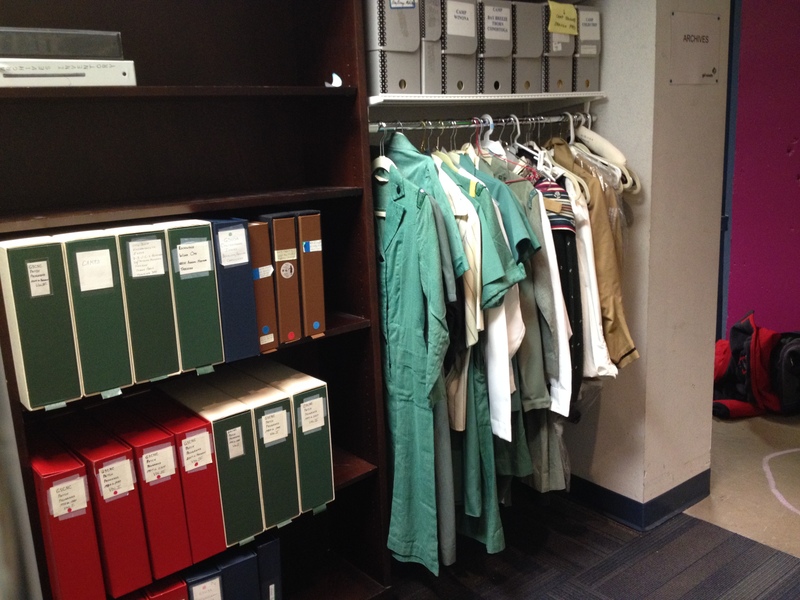 Any uniforms at the Council office tend to be new acquisitions to process, borrowed items en route back to offsite storage, etc. The pod space is a transit point, not long-term storage, for much of our collection.